The lecture will take place October 16 in 205 Smith Hall at 6:30 pm. In conjunction with the lecture, The Fuel and Lumber Company presents an installation of Jiha Moon’s ceramics and works on paper in its Tuscaloosa Project Space. The exhibition and a reception for the artist will take place immediately after the lecture. Both are free and open to the public. Jiha Moon (b. 1973) is from DaeGu, South Korea and lives and works in Atlanta. She received her MFA from the University of Iowa in 2002 and has had solo exhibitions at the Museum of Contemporary Art, Atlanta; Weatherspoon Museum, Greensboro; Mint Museum of Art, Charlotte; Cheekwood Museum of Art, Nashville; Ryan Lee Gallery, New York; Saltworks Gallery, Atlanta; Curator’s Office, Washington, DC and internationally at Miki Wick Contemporary in Zurich and Arario Gallery in Seoul, among others. Moon’s work has been included in recent group shows at the Hunter Museum, Chattanooga; McNay Art Museum, San Antonio; Atlanta Contemporary Art Center; Smith College Museum of Art, Northampton; and in New York City at the Asia Society Museum; The Drawing Center; and White Columns. She has been selected for prestigious residencies at Art Omi, Acadia Summer Art Program, Headlands Center for the Arts, The Fabric Workshop and the MacDowell Colony. Moon received the Joan Mitchell Foundation’s Painters and Sculptors Award in 2011 and was awarded the Museum of Contemporary Art of Georgia’s Working Artist Project in 2012-2013. Her work as been written about by Art in America, Artforum, the New York Times, Art Papers, the Washington Post, and the New York Sun. 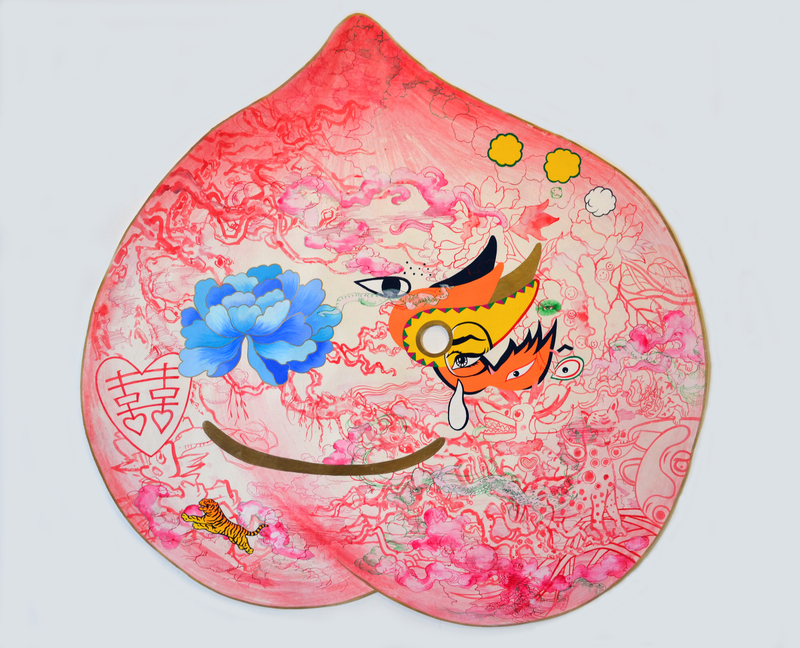 Image credit: Jiha Moon, Peach Mask II, ink, acrylic, Hanji. Image courtesy of the artist.